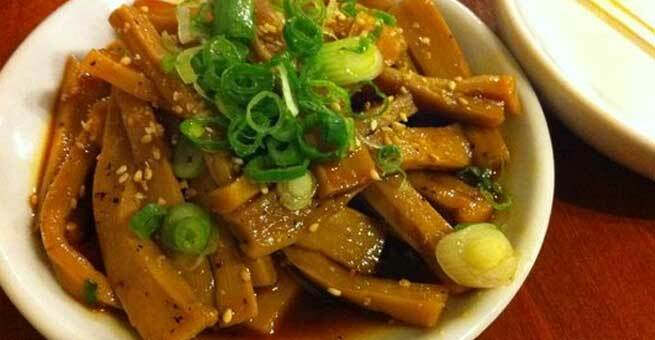 Cut the bamboo shoots into long thin pieces. Pour 1 cup of salad oil into a large skillet and heat it up. Add the pieces of bamboo shoots to the heated salad oil and stir fry them till they turn slightly brown. Shift them on paper towels to absorb the oil completely and discard the oil present in the skillet. Now, pour rest of the salad oil into the skillet and allow it to get heated once again. Meanwhile, blend sugar, cornstarch, and cold water together in a small mixing bowl. 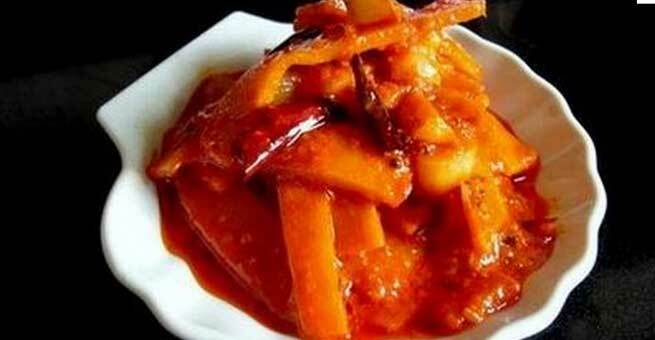 Once the oil is heated, put the fried pieces of bamboo shoots in it and cook for 10 to 15 minutes. Add the cornstarch mixture and soy sauce to the skillet and keep stirring till the gravy becomes thicker. Finally, garnish with finely shredded parsley. Shred the bamboo shoots finely. Also, clean the spinach properly and make small bitable pieces of it by using your hands. 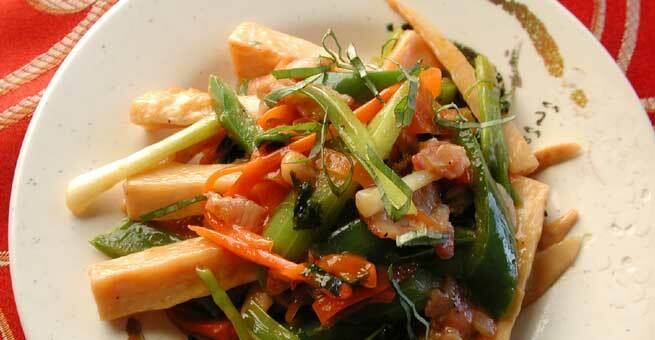 Now, heat up the salad oil in a large skillet and add the chopped bamboo shoots to it. Coat them with the heated oil nicely and stir fry for minimum 2 minutes. Put the spinach in the skillet and sauté for a couple of minutes. Also, add the soy sauce and salt to it and mix everything well. Set the flame to high in order to reduce the quantity of gravy. Last, pour it in a serving dish and serve hot. Start with grating the bamboo shoots and placing it over the flame for boiling. In the meantime, chop up the tomatoes, mash the garlic cloves and pulverize the spices like cinnamon, dry red chilies and cloves to form a smooth powder. Now, heat up cooking oil in a shallow pan. Put the spice powder and mashed garlic to it. Stir fry the entire thing till oil is released. After that, add tomato slices to the pan and sprinkle them with salt. Cook at low flame so that the tomatoes get tender. Add boiled bamboo shoots to it and pour hot water into the mixture. Put the lid over the pan and wait for 10 minutes to let the concoction dry up. Make small pieces of bamboo shoots and boil them for 2 to 3 minutes. Shell and devein the shrimps and wash them properly. Slice up 3 onions thinly and chop up the rest one. Crush the ginger and garlic to form an uneven paste. Grind the dried whole red chilies finely. Now, heat up cooking oil in a large skillet and put the onion slices in them. Sauté for some time. Once they become golden brown, add raw shrimps, chopped onion, ginger-garlic paste, ground red chili, chili pepper, salt and saffron to the skillet one by one. Mix all the ingredients well. Set the flame to low and cover up the skillet. After 6 to 7 minutes, remove the lid and pour the coconut cream into the mixture. Stir for another 3 to 4 minutes. Finally, take the skillet out of the heat and serve. 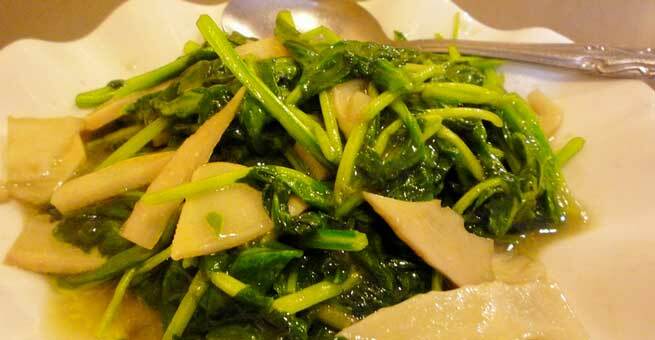 Take only the soft portions of the bamboo shoots and cut them into small pieces. Soak them in water overnight. Then, strain the water completely and add fresh cold water to the shoots once again. Also, add salt to the water and boil it. Once the shoots become extremely tender, take them out of the heat. Drain the water and set the boiled shoots aside. Meanwhile, put turmeric, mustard seeds, cumin seeds, and dried red chilies in vinegar and leave it for the whole night. As soon as the mixture gets soft, grind it along with the ginger and the garlic cloves in order to form a paste. Now, heat up oil in a shallow fry pan and add this paste to it. 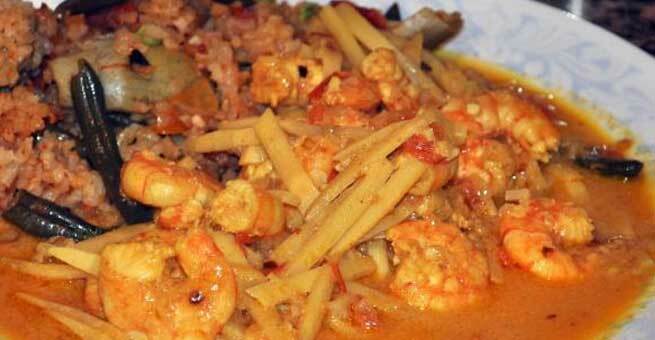 Also, add the curry leaves, boiled bamboo shoots, sugar and a little more salt to the pan. Keep stirring until the oil starts to release.